You are a Pisces zodiac sign if you were born between February 19th to March 20th. 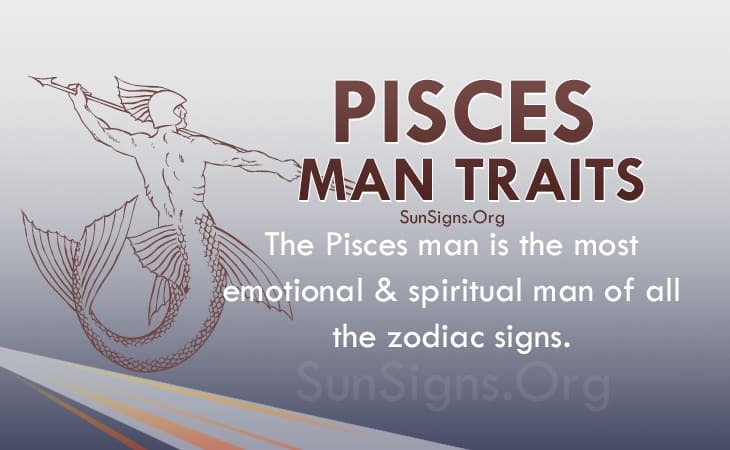 The Pisces man personality is possibly the most emotional and spiritual man out of all the other zodiac signs. For the most part, Pisces seems to take all of the best traits of the other signs and combine them into his own zodiac personality trait. For instance, the Pisces man will not bother with things that he knows will hurt others. He will try to be the best friend that he can be. The Pisces man traits show he is likely to be generous and helpful to his friends, as well as other people in need. The Pisces male is likely to volunteer in his spare time or do other good work that can help other people. He cares more about his impact on the world than himself. The Pisces man characteristics show he wants his name to live on as a good one, rather than a curse. The last thing that the Pisces man will be remembered for is his selfishness, as he likely doesn’t have a selfish bone in his body. The Pisces man personality traits show he will be likable and calm on the outside, especially when he is helping others. He cares so much more for helping others that he sometimes loses sight of himself. This could cause problems in his personal life. The most likely scenario is that he will be so caught up in trying to help others that he will become stressed out when it comes to his everyday life. The Pisces man personality is likely to have a decent job to pay for all of his good deeds, but bills, family troubles, and emotional issues still happen to good people who mean well. This is tragic, as he is likely not to bother anyone about his feelings until he is incredibly upset, which is likely to lead to problems. The Pisces man traits show he is likely to have many friends in all shapes, colors, and religions. He is a very open-minded man and will accept friends of all sorts, regardless of their beliefs. All he cares about in a friend is that they are trying to do their best to help the world. He will not be attracted to materialistic or self-absorbed people. He will want to be around creative individuals and people who just generally seem to be full of life like himself. The Pisces man characteristics show he spends his time dreaming of an ideal world, and when he speaks to others he will be sure to share his ideas. Others might be confused about the way that the Pisces guy looks at the world. Others may simply see him as an idealistic daydreamer. In reality, the Pisces man personality has many great ideas that could very well change the world for the better. While he may dream of ending world hunger, he knows that he can’t do it single-handedly. With a problem like hunger he will likely start-up a project on his own, like setting up a can drive or raising money for poor people who can’t afford food, but he knows that it is a big job that he will not be able to do completely. He cares more that he tried to help at all. The Pisces men are likely to let their emotions get the better of them on more than one occasion. This could cause him to make poor decisions based solely on how he is feeling that day. This could cause him to quit his job, cheat on his wife, or on the better end of the spectrum he may join a group that can help others or adopt a pet from a shelter. The Piscean will need to learn how to keep his emotions in check and think over his decisions more if he wants his life to be more stable. A relationship with a Pisces man can be nothing short of an emotional roller coaster ride. He will want to fall in love, but this may cause him to rush things, which many of the other star signs will not like. This can make it harder for Pisces to find his ideal partner, but once he does he will be loving and loyal, and he will expect the same from his partner.